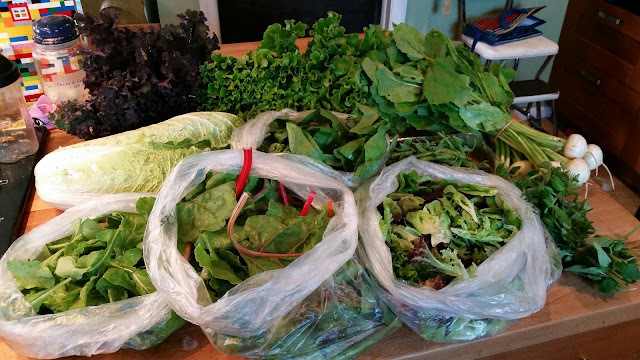 My Honey Brook Organic Farm Premium Boxed Share for Week 2 included arugula, swiss chard, salad mix, spinach, napa cabbage, turnips, oregano, sugar snap peas and two types of lettuce. 1. Freeze anything you don't think you can use before they go bad. 2. Add greens to your smoothies or juice them! We all know adding spinach or kale is a great way to boost protein, vitamins, and minerals in your smoothies, but lettuce is also a great addition. Lettuce is chock full of vitamins and minerals like calcium, iron, magnesium, phosphorous, potassium, zinc, thiamin, riboflavin, niacin, folate, and vitamins B6, C, A, E, and K.
3. You don't have to eat salads all week. Add greens to your soups, pasta, spring rolls, stir fries or even make pesto. Try non-traditional American recipes, there's a whole other world of food out there. 4. Get into pickling! There are a bunch of easy recipes for pickled radishes, or even kimchi. 5. Dehydrate them, or season and bake at 200 degrees for a few hours and make them into chips. Or don't season them, dehydrate them, and grind them up into a green powder to add to whatever. 6. You could can them, but in my opinion, you're better off freezing them. 7. Check out, not just vegetarian or vegan recipe sites/blogs, but tap into the raw vegan community. They have some amazing, out of the box ideas for all veggies. We've been using up a lot trying out Food52 Mighty Salads, which initially I thought was a dud of a cookbook, but has turned out to be really good! Inequality in share distributions aside, I will say I am getting my money's worth. A CSA might be hard for some, but if you're willing to expand your horizons and try out new plant-based recipes, I think you'll do just fine. If I was counting the discrepancies in share distributions, I'd give this a C, but if I ignore that, I'd give Honey Brook's CSA a B.